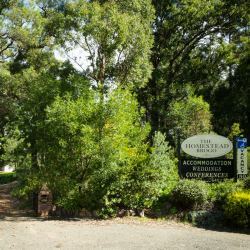 The Homestead Brogo offers you effortless country charm within a short drive to some of the Sapphire Coast's most beautiful beaches. Boutique accommodation in a tranquil rural setting. The perfect country location for your wedding day which includes church ruins or 5 acres of landscaped gardens for your ceremony. We also offer 3 self contained luxurious cabins that sleep between 2 and 5 guests per cabin.